I also ran into a technical problem, however, that has deterred me from creating more of these. I want to be able to associate text with the elements of these maps, beyond just the text that appears in the bubbles. At one point, I used a Dreamweaver plugin to add pop-ups, so that when a student hovered their cursor over a portion of the map, text popped up explaining the element. This was pretty cool, I thought, but revising these pop-ups was not straightforward; I had to use Dreamweaver, and remember how the plugin worked. Also, I would normally have the same content somewhere else, perhaps an entry on my course webpage. 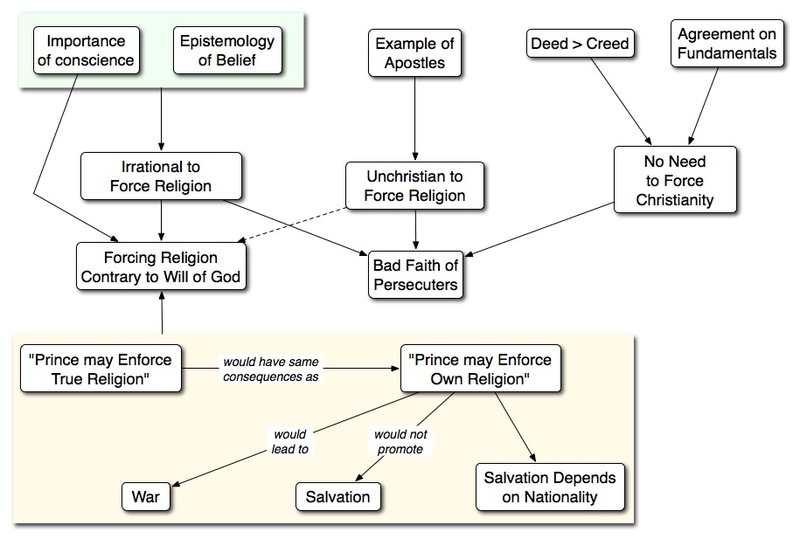 If I updated that entry, I would have to remember to update the concept map. Then my Dreamweaver quit working, and I’ve been stranded ever since. I’ve looked at cmap, but it doesn’t have pop-up text (yet?). I use OmniGraffle to make my maps, and it will save html image maps, and will even save info about each element, but it won’t generate the html that will pop-up said info. At one point I looked into integrating concept maps into tiddlywiki, because TW’s micro-content approach seemed to fit nicely with the concept map idea (one “tiddler” per concept), but that didn’t really work either. I guess that there are really two problems, here. The first problem is that the content that is associated with the elements of my maps is stored separately from the map itself – it’s not connected in any way – and so it’s hard for me to keep synced, and to move back and forth between map and text. The second problem is that when I display the maps, I don’t have an easy way of making that same content available to others. Ideally, one and the same body of content could be viewed and navigated and edited in two different modes: visually, in map form, and textually, in wiki-mode. Same content, two different depictions. Does this technology exist, anywhere? Please take a look at Webspiration by Inspiration Software. You can find it at http://www.mywebspiration.com. ‘Ask and ye shall receive…! Based on a quick perusal, Webinspiration looks like very nice software. The maps can be webs, not just trees; you can add notes to concepts (which popup when the concept is clicked); concepts can be hyperlinked to other things; multiple people can collaborate on creating a map; there is a handy outline view. The only problem I see, at the moment, is that one can only share one’s maps with people who have registered as users of Webinspiration. That wouldn’t work for me, for a class of 240 students. I can’t be requiring them to register as users in order to have access to the maps I’ve created. I would expect to register, and ultimately pay for the service, but I would want the maps to be viewable by anyone, or transportable. In any case, thanks for the heads up and I will follow the development of this software closely. One further thought. The “outline” view of a diagram is perfect for tree-structured diagrams (which I guess are generally called “mind maps”). But for a concept map that has a web-like structure, they’re not quite right. Better would be a wiki-based text-view. Why? Because a wiki has the web-like structure of a concept map. In the simplest case, if one has two concepts, and three possible relationships, then either A →B, A←B, or A↔B. In wiki terms, either A contains text that links to B, B contains text that links to A, or both. There is a bit of a disanalogy, there, because in a wiki the starting point of the arrow is text contained within a post, not the whole post, but that doesn’t matter I don’t think; if multiple words within a post link to a single other post, that would just show up in diagram view as one arrow. The other disanalogy is that in a diagram links can have qualitative labels, as well as direction. Ok, so there is some loss of information moving from the diagram to the wiki version. Still, an interesting possibility, I think. We are currently working on a “Publish” feature which will enable your large class of students to view (or embed) your maps without needed a Webspiration account. Look for that in the near future. Perhaps still another perspective.. What about students having a free application on their own machines and if they want to see or use the content you created (or vice versa) then you can send it to them or allow them access to import it. The app that I am thinking of, is designed to bring together multiple perspectives and create ‘objects’ that can be reused, recalled, related in multiple contexts and updated with many pages of information each. I worked on this for the past 15 years AND have been a user. Ron, you’re referring to PMM? Looks very good, though unfortunately only for PC. Based on the video available at the site above, PMM allows one to create an interconnected knowledge base, each concept having notes and attachments, and links (categorized) to other concepts. Different “sheets” are simply different views or portions of the knowledge-base, but they’re all connected. You can cycle through from note to note, following the links, as you might in a wiki. Or you can browse the graphical display, from sheet to sheet. Hi Andrew, yes PMM is what I meant. You summed it up nicely. Very easy or required for students… is that really so? Perhaps I overestimate the effect, but should that not be the primariy intrinsic motivation of any means in the classroom? The effect would be: 1) it is mine even though I started with the teacher’s data, 2) I can expand and review it with all that *I* find important and 3) over time, as more knowledge is fed into it (and reviewed), it will grow and stronger and stronger even when I do not. I just wanted to say that I rather like your concept maps. They’re much better than lists of bullet points because they show the relationships between all the different elements of an argument, which makes understanding the general idea much easier (as opposed to remembering different points and having to sort them all out). We are continuing to improve Webspiration. We have recently added the capability to Publish your concept maps so they may be easily viewed by your 240 students. In addition, you can embed them in your blog. Please see http://www.mywebspiration.com.